Emmanuel Eboue will go through a mini pre-season while Sunderland are on a winter break in the Middle East, to fast-track the ex-Arsenal defender back to full fitness. Eboue has been training with Sunderland at the Academy of Light this week, as he bids to earn a short-term contract with the Black Cats after his release by Galatasaray at the end of last season. 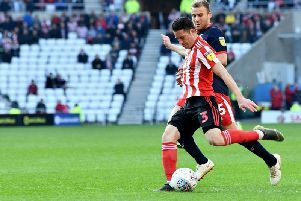 But the 32-year-old will not be in the Sunderland party which heads to Dubai after tomorrow’s visit of Manchester United for a week of warm-weather training. Instead, Eboue will work with the physios at the Academy of Light during the fortnight break from Premier League action to see if they can swiftly get him into shape, with his conditioning understandably lacking. Sunderland boss Sam Allardyce said: “Eboue won’t go to Dubai – he’ll stay here and do some pre-season work. “He’ll do a mini pre-season – mornings and afternoons, with a couple of Under-21 games and when we come back, we’ll probably have a behind-closed-doors game and decide whether to do it or not (offer him a contract). “I’m not sure what he’s been exactly doing since leaving Galatasaray, but it’s that usual fall-out from Turkey. “We got (Dame) N’Doye and that’s a similar situation. “As long as he doesn’t pick up any injuries, we can fast-track his fitness. “You’re putting his body under pressure, so he can easily tear or tweak a muscle, which would defeat the object. “Getting him fit, but not getting him injured is the most important thing in the next two weeks. Allardyce had been chasing a new right-back during the January transfer window, but saw moves for Arsenal’s Mathieu Debuchy and Lorient’s Lamine Gassama come to nothing. But, despite the end of the transfer window, Sunderland are still able to sign any free agents available. Sunderland only registered 23 out of a maximum of 25 senior players with the Premier League after the transfer deadline – leaving two spaces free for possible Bosman additions. Allardyce added: “Emmanuel Eboue has got a fantastic pedigree at Arsenal and if he’s got the capabilities of producing that here, then we’ll assess that over the next few weeks. “He’s obviously not played for a long time, so our aim is to see if we can get him fit and then see if he produces the sort of performance that benefit us. “If not, he won’t be taking him on.